It is hard to believe that the Assassin’s Creed franchise is almost a decade old. Assassin’s Creed Origins marks the 10th console installment in the series that began as an innovative proof of concept which started the trend of open-world free-running parkour, tower climbing map unlocks, and auto-tracking combat mechanics. While the series drew commercial and critical acclaim in its first few outings, majority of the players started to feel disillusioned in the later years as the series developed a rocky reputation, based on the incremental nature of improvements and gameplay changes, necessitated as a result of its annual release structure; and many felt ready to write off the franchise. It became apparent that the Assassin’s Creed brand had become stale, franchise fatigue had set in and it was a sign that things needed to change. It took them a while, but Ubisoft finally realized their folly and broke the yearly cycle of release; taking a step back to re-examine the Assassin’s Creed Franchise and reinvent the series in the form of Assassin’s Creed Origins. 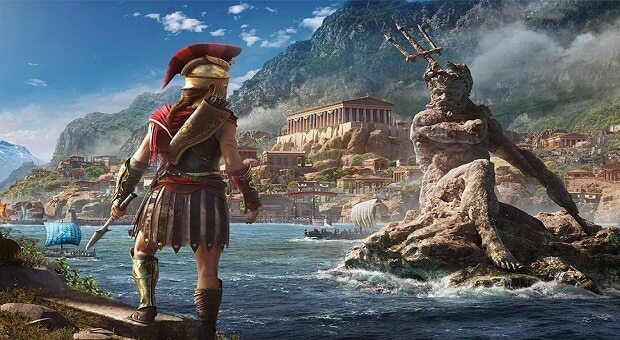 Developed by the same core creative team that brought together the fan-favorite Assassin’s Creed IV: Black Flag, with Assassin’s Creed Origins, Ubisoft Montreal has taken the opportunity brought from the year off, to aggressively change the core gameplay elements that defined the experience of that constituted an Assassin’s Creed game. Now that the game is near its release, the question arises whether Assassin’s Creed Origins has enough brand-new elements to freshen up the franchise in a way that the fans of the series have been hoping for, or are the changes too little and too late to bring back the burnt-out fanbase and re-establish the reputation of Assassin’s Creed? Assassin’s Creed Origins is set in the Ptolemaic era of Egypt, during the time when the Pharaohs of Ancient Egyptian Culture had declined to Royal Dynasty of Macedonian Greek decent, at the time of the rule of Ptolemy XIII and Cleopatra VII. The political upheaval brought through the competition between two pharaohs sets things in motion that makes Bayek, a loyal Madjey, set his path on a personal journey of vengeance, that takes him across Egypr; bringing him face to face with several historical figures and leading him to the roots of the titular ‘Assassin’s Creed’. 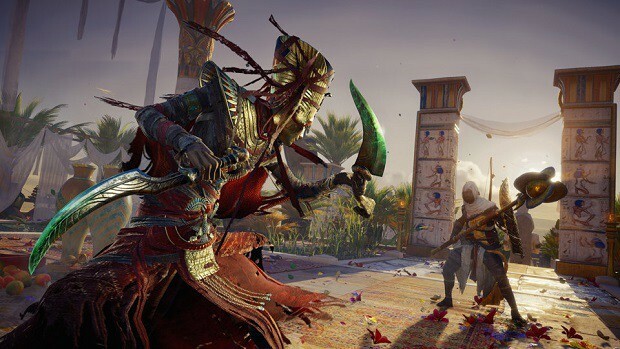 Even though his personality lacks the roguish charisma of past favorites like Ezio and Edward Kenway, Bayek does have moments that break him out of his angsty shell, which makes him a more balanced character than the somber and stoic Altair and Conor. While the story in Assassin’s Creed does feature its share of twists and turns, the main thread is not much different than the staple story structure featured in past Assassin’s Creed games, and unfortunately that also means that it retains the choppy flow of storytelling that the previous games in the series have fallen victim to. 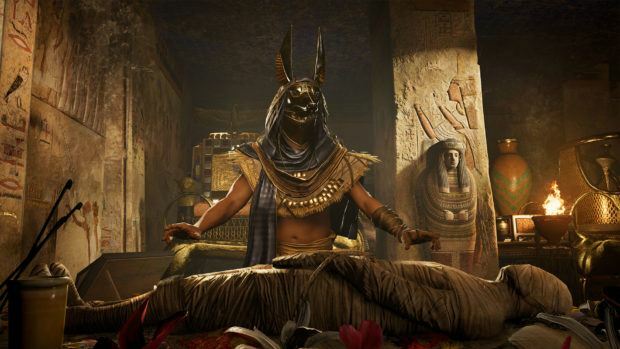 However, as with other Assassin’s Creed games, the saving grace of Assassin’s Creed Origins is in how it integrates its fiction with the history of the time period it is set in, and allows players to experience the heydays of iconic locations like Nile Delta, Alexandria, Hypodrome, Giza and Memphis. Speaking of locations, despite being set in the deserts of ancient Egypt, Assassin’s Creed Origins features quite sizable variety of landscapes ranging from sand dunes, rocky hills, barren plains, caves, marshes and oasis; these not only contain quite a bit of detail but also house settlements and sites like cities, villages, camps, farms, markets, tombs, temples and pyramids. Unlike Assassin’s Creed Unity and Syndicate, Origins is less about vertical navigation and more about exploring the land. Apart from specific structures like temples and pyramids, most of the Egyptian locations do not contain many buildings that tower over, which feels sort of similar to Black Flag, but without the presence of the ocean. Speaking of Black Flag, the map size in Assassin’s Creed Origins is huge; it is a vast landscape, but with a whole lot of nothing. Like Black Flag had seas to cover, Origins has sandy or rocky barren desert, and while it looks pretty good as a vista, there is not much to do there, except to travel from point A to B. Whereas games like Black Flag and Red Dead Redemption added character to their surroundings which made exploring vast oceans and barren lands enjoyable to explore, Origins’ landscapes lack any oomph, and come off as bland environments that are complimented by lots of subtle and ambient music. Also, despite its four-yearlong development cycle, Assassin’s Creed Origin still reuses a lot of old animations. 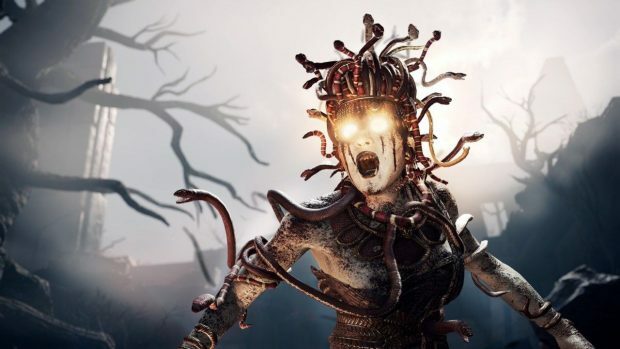 Sure, there are a lot of new animations added to Origins, but there are way too many holdovers from the previous games, which gives the game a feeling of staleness and sameness, at a time when the Assassin’s Creed series could have really benefited from a major visual overhaul. Most of the core gameplay in Assassin’s Creed Origins remains the same. The player has to navigate and explore the world to find goals and objectives, stay hidden until the most opportune time, and pick off enemy soldiers one by one to reach the assassination target. Like all other games in the Assassin’s Creed franchise, Origins allows players to freely roam and explore the massive open-world representation of ancient Egypt. 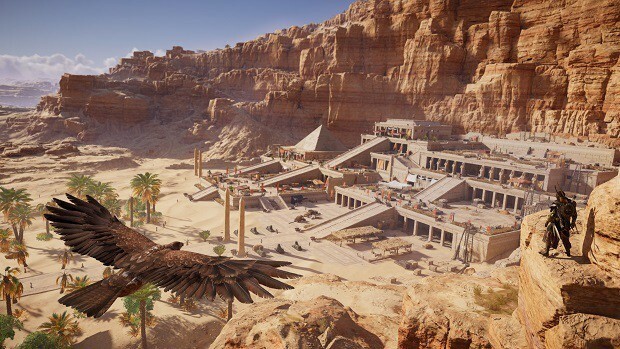 Players can either traverse on foot and climb buildings and structures via the unchanged parkour mechanic, or quickly travel through areas by riding steads like horses and camels as well as vehicles like chariots, carts and boats. 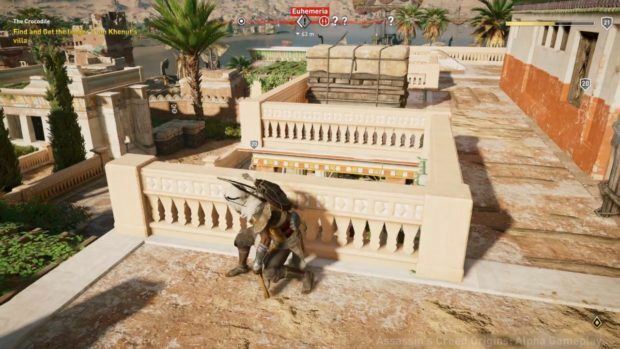 Assassin’s Creed Origins does away with the series’ staple mini-map and requires players to take note of their environment and keep track of their surroundings. The game also removes the tower-climb mechanic, but there are still synchronization points available all over the world, that update the world map and act as fast-travel points. 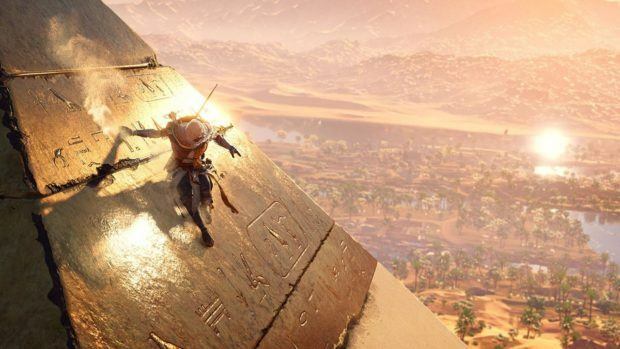 The stealth mechanics in Origins mostly remain unchanged from the previous games in the series. Players can still crouch down to enter into stealth mode, they can hide in bales of hay and shrubbery, as well as behind pillars and waist high fences. The way Origins changes things up is by removing the ability to scout and highlight enemies through “eagle vision”, replacing it with an eagle companion called Senu, who can do the same for Bayek. 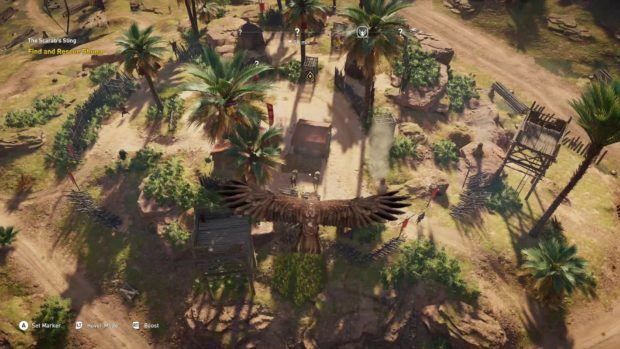 Players can take control of Senu to do some aerial surveillance and tag the enemies, which would then be highlighted when controlling Bayek during the actual infiltration. The mechanic works exactly the same as how scouting worked in Ubisoft’s own Far Cry Primal and Ghost Recon Wildlands. Unfortunately transitioning to and from Senu results in some loading as well as visual popup in the environment, that undermines the draw distance and the visual aspects of Assassin’s Creed Origins. 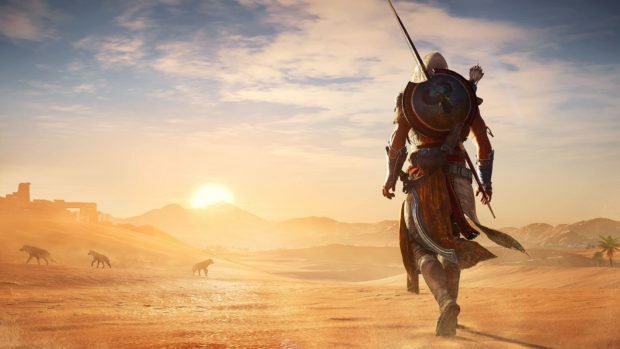 Going through the world, finding locations, completing story missions, side quests and defeating enemies, constantly earns player experience points, that can level up Bayek. 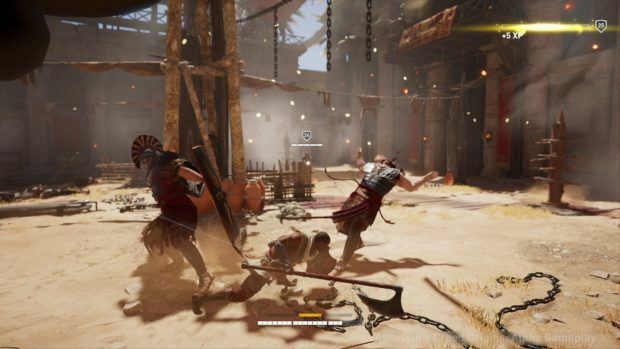 Leveling up gives Bayek attack and defense bonus, as well as gains him the ability to acquire new skills, which can be selected from the game’s upgrade system, that is divided into 3 skill trees; Warrior, Hunter and Seer. Warrior skills are focused on combat and range from gaining ability to parry, to getting able to carry more than one weapons simultaneously. Hunter skills are stealth focused and give options for bow based ranged abilities as well as buffs for hidden assassinations. The Seer skill tree focuses on tool based abilities, allowing players to learn how to use special darts or even learn how to tame animals. During their journey, players will come across a variety of flora and fauna; Bayek can encounter tame animals like goats, cows, chickens and horses that usually roam in and around settlements, but he can also run into aggressive wild predators like hyenas, hippos, lions and crocodiles; and as mentioned previously, players can also gain ability to tame various predators which then serve as a companion and assist them against enemies. Another way in which the Assassin’s Creed facilitates the players in fighting enemies is by inundating them with different types and variety of weapons. The weapon types featured in the game include melee weapons like straight swords, sickle blades, dual swords, clubs, maces and hammers, axes, scepters and spears, as well as ranged options like bows, that come in different variety, and tools like fire bombs and arrows, as well as sleep and poison darts. These weapons are acquired through loot drops that vary in rarity, ranging from common and rare to legendary varieties, that can include buffed variants like poison laced weapons and fire arrows. Players can also collect materials and craft upgrades for their tools, as well as upgrade their weapons and armour by paying an in-game blacksmith and weavers. One of the major complaints that the Assassin’s Creed franchise has faced over the years is that its melee combat mechanic had become stale due to its repetitive and unengaging nature. Assassin’s Creed Origins addresses this issue head on and does away with the old melee system by totally overhauling its combat mechanics. Unlike the previous combat system that was dictated by a series of predetermined animations based on player inputs and scripted AI movements, the new melee mechanic is more organic and based on a hit-box system. 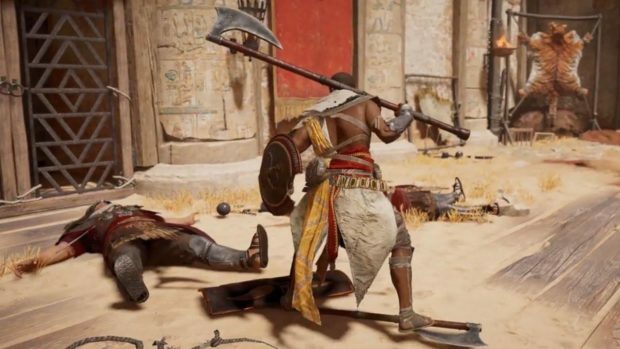 This means that according to the length of the weapon wielded by the player and the distance of the enemies, Bayek will strike whatever body part is in range and can miss an enemy entirely if he or she is not in range. While the new system is less button-mash heavy, and far more engaging than the combat mechanic in previous Assassin’s Creed games, there is still some polish and fine tuning required, as it is a bit choppy and clunky in execution. Origins also incorporates the aforementioned level system for each enemy soldier and target. The game puts a lot on emphasis on trying to guide players into making sure that their character level is comparable to the enemies’ level, as encountering enemies more than 2 levels higher makes the encounter a needless chore by turning each higher-level enemy into damage sponge. This implementation of level system, and the focus on maintaining a level parity with enemies and objectives needlessly elongates the game campaign, which is already quite large as it is. After first few levels, catching up with story critical mission levels requires players to do side-missions and lots of repetitive busy work to level up, just to increase that number. The issue is that progression is defined around matching the arbitrary number of the character level with enemy level, and not about learning specific abilities or gaining expertise / mastery over gameplay mechanics. At the end of the day, it becomes all about numbers. However, if the challenge and melee fighting mechanics are to the player’s liking, then there are a lot of combat opportunities that Assassin’s Creed Origins throws at the player; from higher level missions, to tough bounty hunters persistently hunting for the player across Egypt, as well as gladiatorial arenas where players can fighte opponents to their heart’s content. 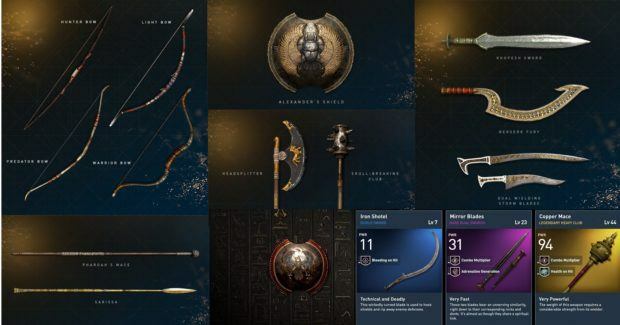 Aside from the combat opportunities and the main story missions, there is still a lot to do within Assassin’s Creed Origins as the game is stuffed with many side-missions and collectables, that would provide hours upon hours of entertainment for anyone interested in playing through an updated version of the Assassin’s Creed formula. While Assassin’s Creed Origins takes couple of steps to move past the tired old mechanics of the franchise, it still falls into trap of relying on some old crutches, and is not able to totally revolutionize the series to provide the much-needed breath of fresh air that it so desperately needed. 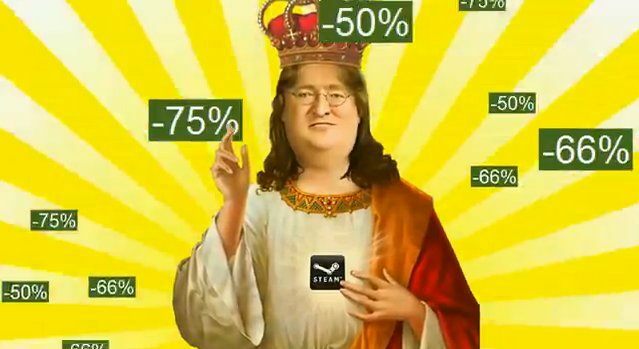 Steam Summer Sale Hopefully Starts Today, An Assassin’s Creed Origins Discount Perhaps?